Aardenburg Imaging and Archives, founded in 2007 by Mark McCormick-Goodhart, engages photographic and printmaking communities worldwide in the curation of artistic and scientific materials, data, and media essential to the creation and preservation of images. Augmented by a unique collaboration in a free membership, donation-based funding and materials submission model, Aardenburg’s four areas of expertise – Photography, Printmaking, Research, and Archives – seek to provide members with the opportunity to engage in the full spectrum of the artistic, historic, and scientific relationship of photography to printmaking, with special emphasis on the hard copy print in relationship to all areas of expertise. 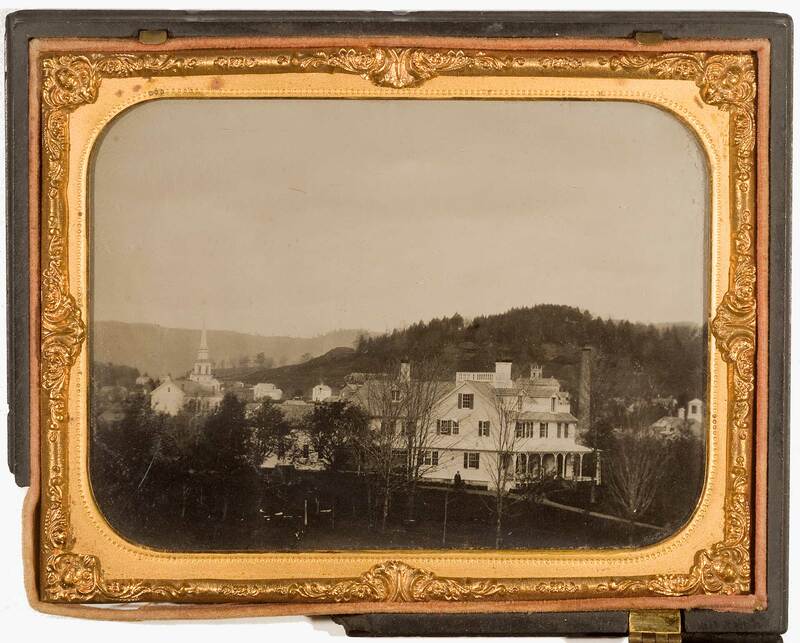 Above is an original ambrotype showing the Hyde House in 1857. At the top of this page is how it appears today. The home is on the National Register of Historic Places. Why is Aardenburg Imaging and Archives not a non-profit corporation? Although non profit 503(c) organizations have a clear advantage in their ability to seek major research grants from other charitable foundations and from corporate sponsors as well, these funding initiatives typically preclude the kind of comparative product testing and publication of product-specific information that Aardenburg routinely undertakes. Our allegiance is to providing the photographic and printmaking community worldwide with new insights and unwavering attention to technical excellence. Our community oriented business model allows us the full measure of independence necessary to accomplish these goals. Donations are welcome and assist with achieving project goals for the betterment of the photographic and printmaking communities. To date, Aardenburg has focused mainly on our Research division, testing image quality and image permanence using the i* Metric, invented by Mark McCormick-Goodhart. The Aardenburg Light Fade Test Results Database provides essential industry insight, helping end-users to make informed choices regarding today’s modern printmaking systems. With over 300 test results available to Aardenburg Members, including downloadable pdf reports for each test, the database includes diverse materials and processes that could only have been tested under Aardenburg’s unique collaborative program. Aardenburg continues to test materials and processes of importance to industry developments, and publishes the results free to Members. We encourage members to complete their “My Account” profile, so that we may know more about our end-users and their needs, in order to better serve the community. We also welcome members’ ideas and requests regarding the testing of specific systems. Aardenburg tests work on a project-oriented basis, with associated funding goals, for merited industry specific product developments. We keep members apprised of project status and donation goals at the project page. Featured Projects are listed at our home page. The Aardenburg General Fund assists us with all Project Funding, plus administration costs, and allows for ongoing lightfast testing for addition to the database. updating the status of reports for ongoing exposure intervals. Aardenburg will soon begin publishing more articles, tutorials, and videos on other aspects of photography and printmaking, to further embrace and share our passion for the art, history, and science of the photographic process. Founder and director of Aardenburg Imaging and Archives, Mark has over thirty years of professional experience in imaging and materials science and holds eight U.S. patents in the field of imaging science and technology. He has also published over 30 papers related to imaging science and photographic conservation. Photography and printmaking has been his special interest for over forty years. From 1988 to 1998, he was the Senior Research Photographic Scientist at the Smithsonian Institution in Washington, DC. In 1996, Mark co-founded one of the ﬁrst fully color-managed digital ﬁne art printing studios, Old Town Editions, in Alexandria, Virginia with colleague Chris Foley. From 1998-2005, Mark was a consultant to Wilhelm Imaging Research, assisting with the development of image permanence test methods for the evaluation of modern digital print media. In 2007, Mark founded Aardenburg Imaging and Archives, to begin image permanence testing using his invention, the i* Metric, and additional innovative testing protocols. Today, Aardenburg Imaging remains the only i* Metric testing facility, publishing the most advanced image permanence information available to photographic and printmaking communities worldwide.